A year on from the Grenfell Tower fire disaster, survivors are marking a week of remembrance - away from the "politics" - for the 72 people who lost their lives. BBC Reality Check has obtained figures showing the scale of the recovery effort, and what's still to be done to start to help the community back onto its feet. In February, at the Brit Awards, London-born grime artist Stormzy used his live performance after picking up two awards to ask the prime minister: "Theresa May, where's the money for Grenfell?" At the time, the government said it had pledged £58.9m, of which £30m had been spent. But the Ministry for Housing, Communities and Local Government (MHCLG) was not able to say what it had been spent on - although it responded to a Freedom of Information request made by Reality Check saying the "majority of the money" had been spent by the council. Since then, the overall pot of money available has increased. On Tuesday, Theresa May said more than £46m of national funds had already been spent on recovery following the fire and another £34m had been promised, bringing the total up to £80m. The council said it had been promised £78m of this, of which it had already received, and spent, £43.8m. Including the money received from central government, the council has spent £256.7m in total so far, by drawing on its own reserves and taking out loans. What has been spent in total? The council has committed over £235m to secure 307 homes, most but not all of which has now been spent. 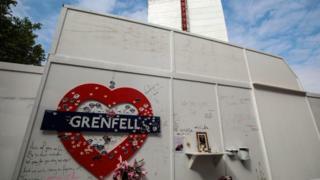 And it has also promised to cover costs relating to the future use of the Grenfell Tower site, which "has yet to be determined by the community". Meanwhile, in addition to the £10m for mental health support services that was given to the council by the Treasury, NHS England spent about £4m last financial year and is set to spend £6m this financial year, through the local NHS Trust, for mental health services for survivors. What is the £78m from the government for? What about cash donated by the public? In addition to the money pledged by the government and raised by the council, £28m was raised in charitable donations, of which £24m has now been distributed. And 200 tonnes of physical charitable donations were also made, of which 41 tonnes of new or almost new items were distributed among the community affected by the fire. The remainder was either sold in British Red Cross shops for Grenfell or turned into cash through recycling, raising an additional £226,000 for survivors. As well as the £80m the government has promised to spend on the survivors and the local area, £78m of which is to go through the council, the government has also committed to spend £400m on removing potentially dangerous cladding from council and housing association owned tower blocks around England. This money will initially come from an existing pot of money intended to fund the Affordable Homes Programme. In May, it was confirmed there were 323 such buildings taller than 18m (60ft) in England that had unsafe cladding on them - including residential blocks and publicly owned buildings such as schools and hospitals. Of these, 311 were judged to be a fire hazard and unlikely to meet current building regulations. Work has started to remove the cladding from 107 of these but so far has been completed in only 10. A total of 72 people died as a result of the blaze, the judge-led inquiry has said. This includes Maria Del Pilar Burton, 74, who died in January. She had been in hospital since she was rescued from the 19th floor. The survivors, who lived in 138 of the flats in the tower and the adjacent Grenfell Walk, have now split into 203 households - 116 from the tower and 22 from the walk. Some of the original households living in the tower contained multiple generations, for example grandparents and grown-up children, who are now being given the opportunity to have homes of their own. The council said it had committed to securing 307 homes to provide the 203 households with a choice of properties.